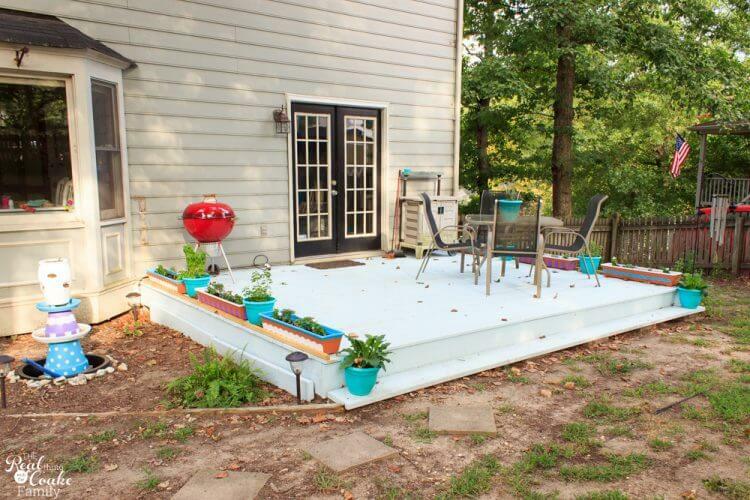 As my daughters and I have been working on our deck makeover this summer, we have found a few side projects that needed to be completed in order to finish the deck. 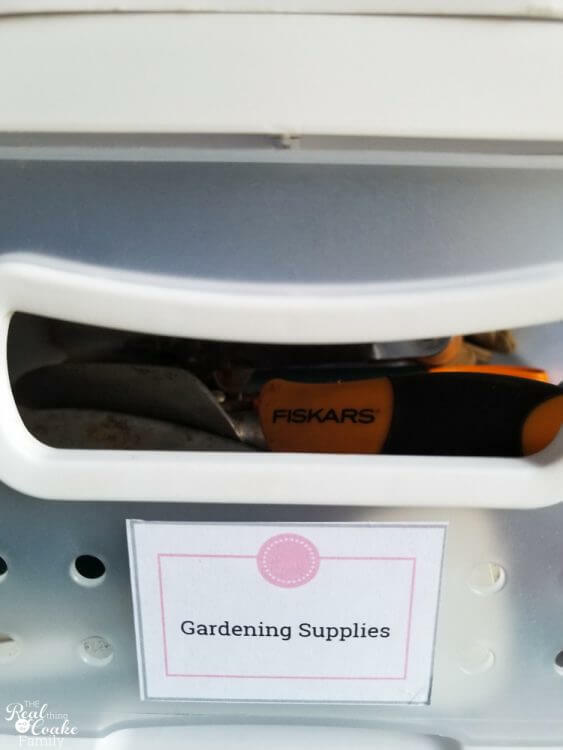 One of those projects was to organize our garden supplies and shed. 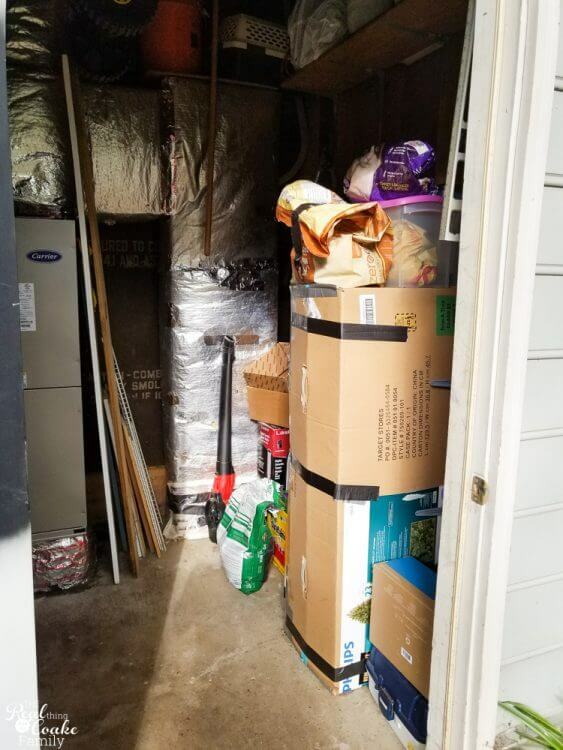 I know for us this wasn't actually organizing a garage, because we don't have one, but I know for most of you that is where all of this stuff gets stored. 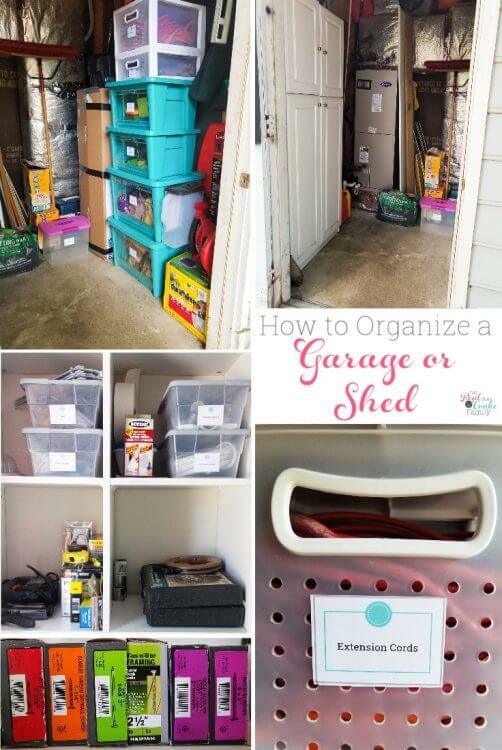 Just take my ideas and apply them to how to organize and store the things you have in your garage. Here is a super big hint of the state of our deck project. Doesn't it look great?! I'll have more info. on those cute pots in another post. 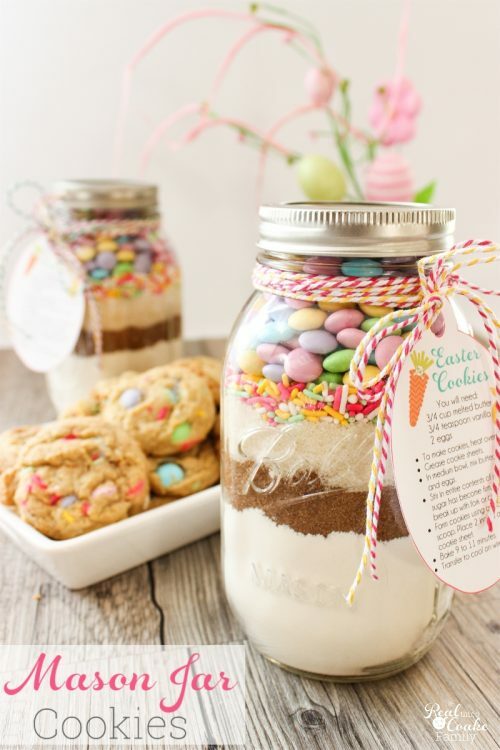 They all go really well with the cute whimsical fountain I made earlier this year. For now, you just get this hint of our deck progress. The main issue we had with how things looked at this point was this old, ugly garden cart. 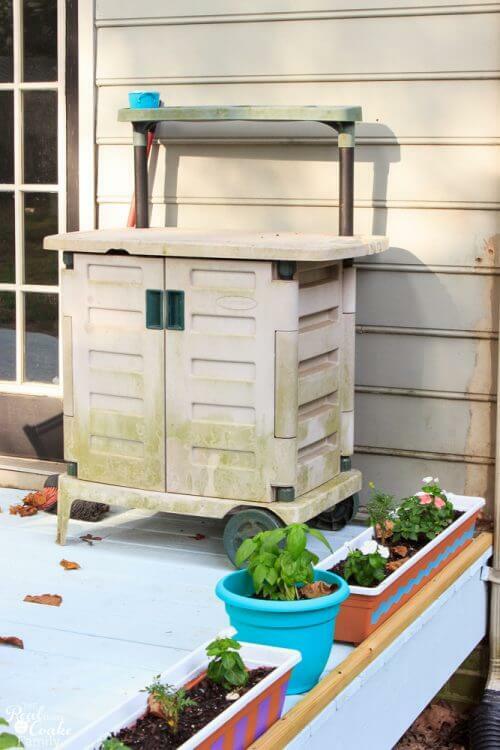 We have had this garden cart since we used to live in Oregon over 10 years ago. It has served us well, but no amount of scrubbing or anything will get rid of the algae or green growth at this point. As much as it was super convenient to keep things in the cart, it needed to go so we could have a pretty deck. 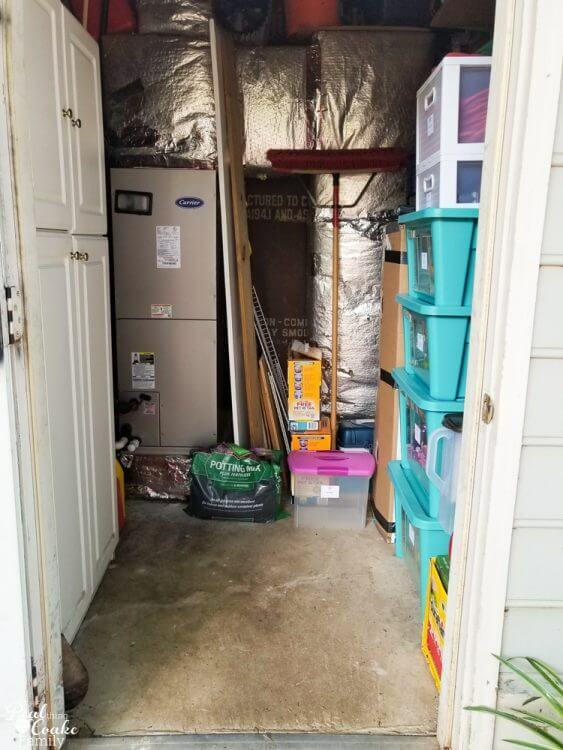 The best solution was to move everything from the garden cart into this little room that is attached to our house that we call our house shed. 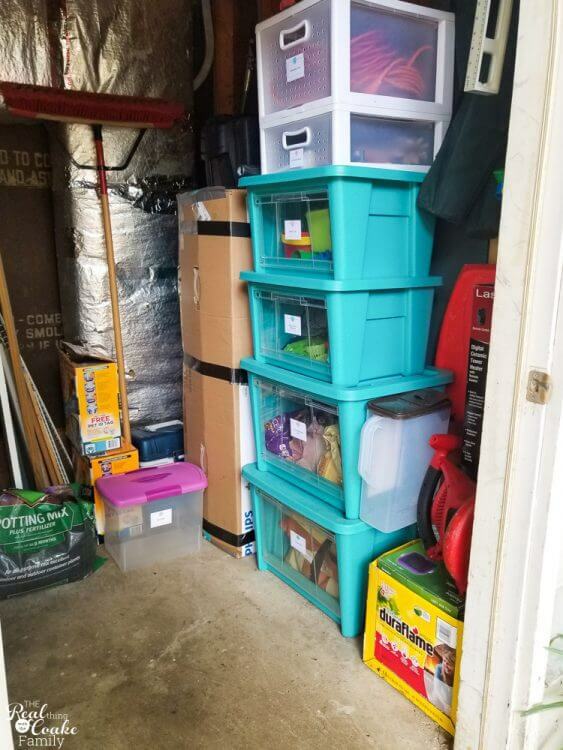 The house shed was a total disaster, but a few weeks ago when my husband was out of town, my oldest daughter took it upon herself to purge and organize this space. I was busy with something else and didn't get before pictures….it was a disaster before she got ahold of it. Too bad I don't have those pictures for you or this organization project would be even more dramatic. 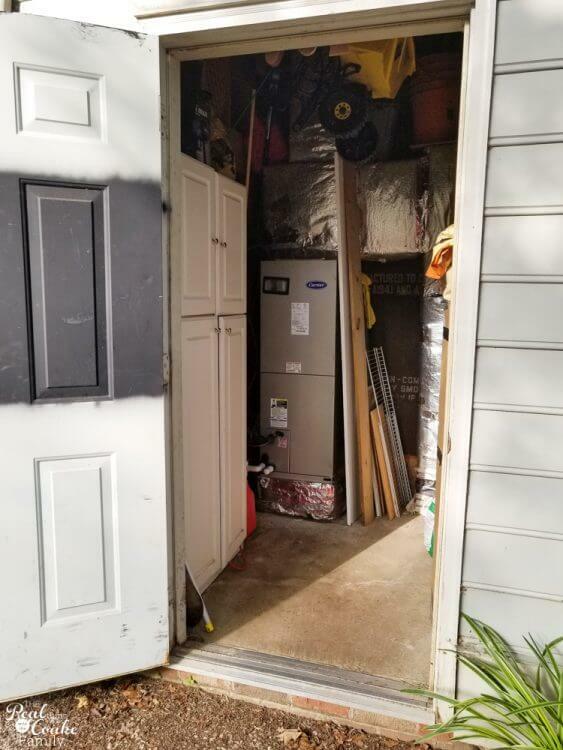 As it is, this house shed houses our air handler unit and all the associated duct work. There is quite a bit of open space for storage. In fact, we used to have an old 2nd refrigerator out here until it died. 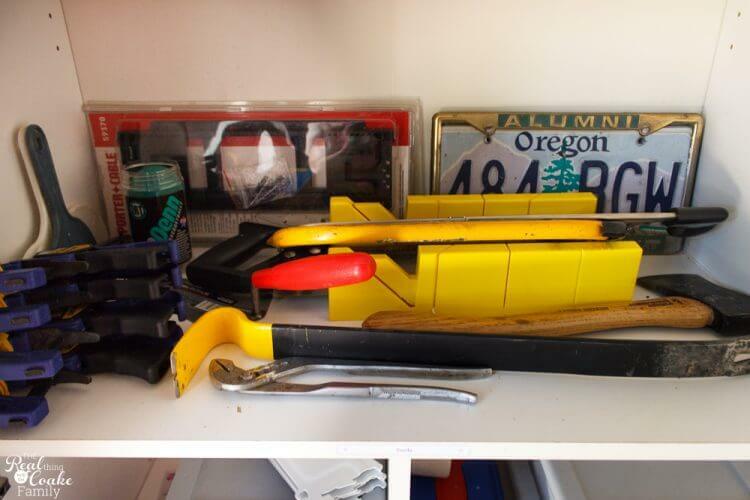 Now, this shed holds a lot of the things that most people keep in a garage. Don't you love what the former owners did with the stripe of paint on the door?! While it is annoying, it is VERY low on my priority list of things to fix in our house. This cabinet had not been touched when my daughter did her re-organization project. It had things just shoved here and there and it had become really hard to find what we needed when we needed it. I'm sure you know what I mean. I call this…random crap. Yep. Pretty much sums it up. As with any organization project, pull everything out that is in the space. Purge. Be ruthless with your purging. If you haven't used it or touched it in at least 3 months, get rid of it. Of course, not when we are talking about tools, but with other little things from this home project or that DIY, you probably won't need that spare part that you keep holding onto. Once you have purged, group like items together. 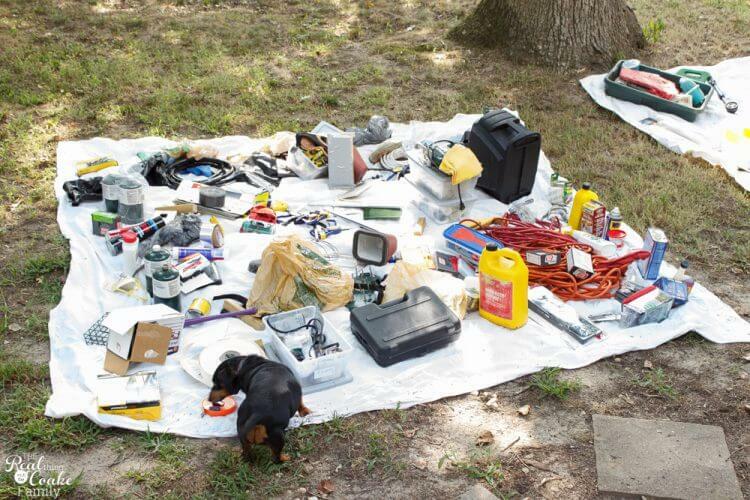 In this case, it was grouping electrical, tools, garden supplies, plumbing, car stuff, pet food etc. Now you need to figure out how you want to store what you are keeping based on what you have grouped together. In this case, I was trying to not spend a penny on this project to organize our shed. 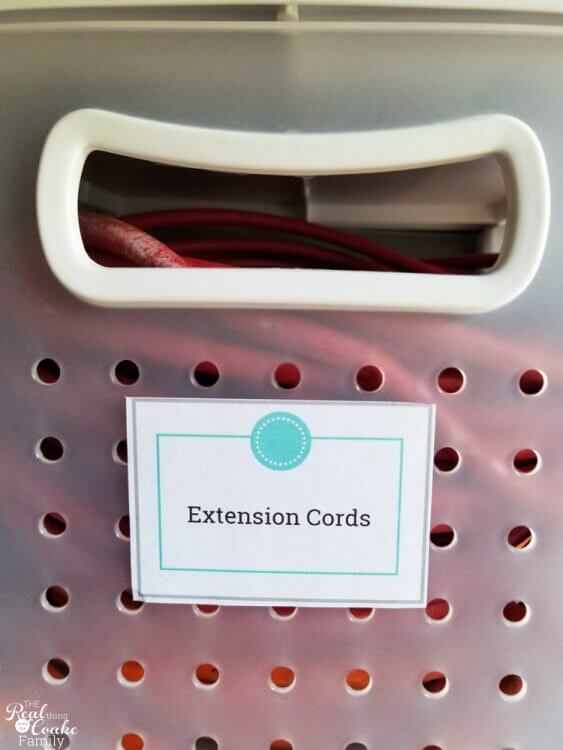 Next to the Christmas tree is a storage bin tower at the top of which I used Sterlite drawers, similar to these (affiliate link), to organize all of our extension cords as well as our garden tools. We are a tall family, so having those up higher works for us. I had these Rubbermaid storage bins (affiliate link) that used to be in our playroom. They have a drop down front. They are really handy for spaces like this. It allows you to keep things in a stacked bin while still allowing easy access to what is inside. Since we access this shed/room from the outside of our house, we have had issues with critters getting to the extra pet food. I keep our daily pet food supply in these cute space savings organizers, but we usually buy larger bags and need to keep them out of the house. 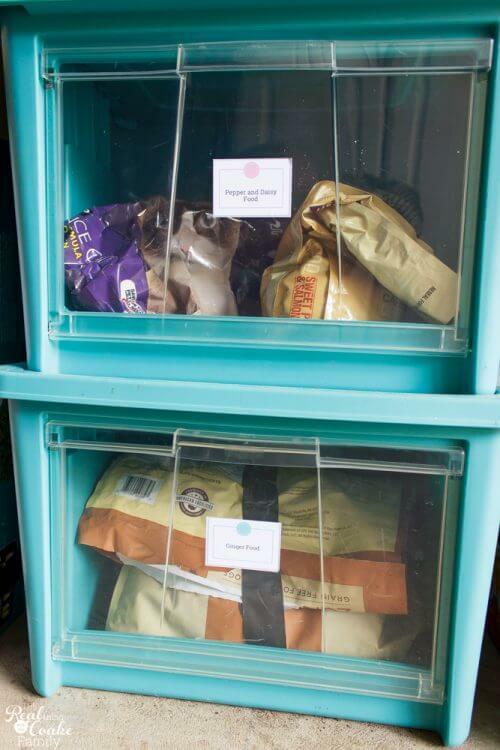 To solve the problem of food where dogs or other critters can get to it, these bins are the perfect solution. Once I had this area organized, I labeled everything. Make sure you label everything! It makes a huge difference in the end result. 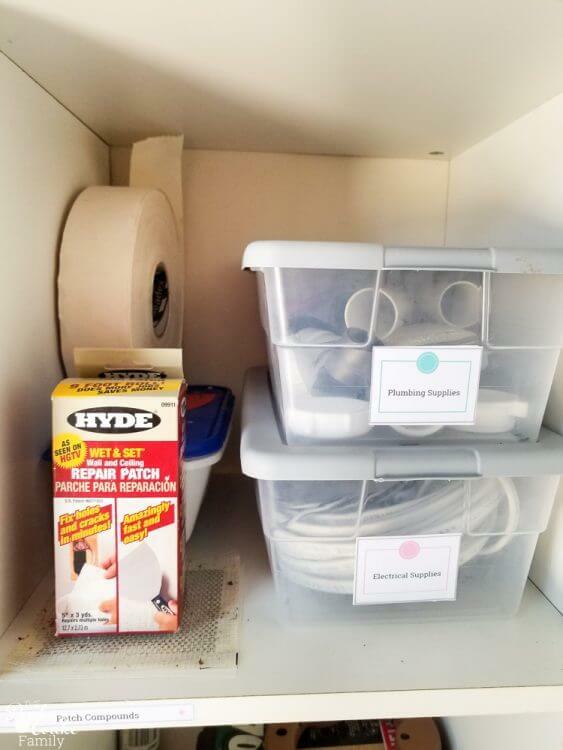 Not only does it make your home look Pinterest worthy, it makes it crystal clear to everyone who uses the supplies exactly where it needs to get put away. This is the new view as you enter the shed/room. 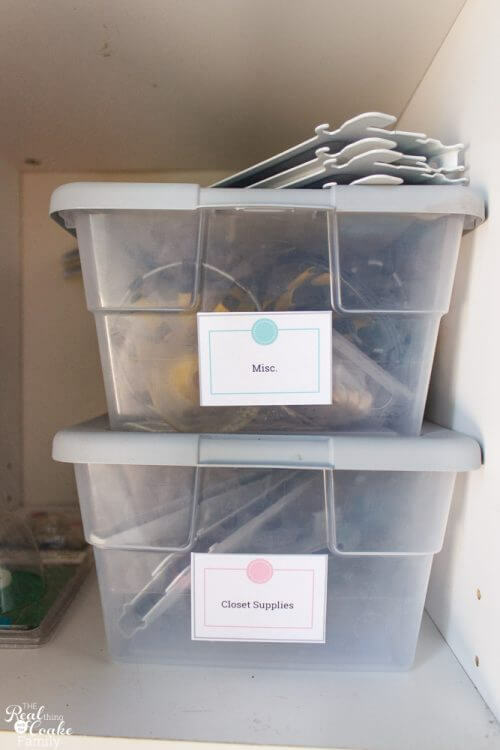 The bins really help to keep it neat and much more organized and tidy. 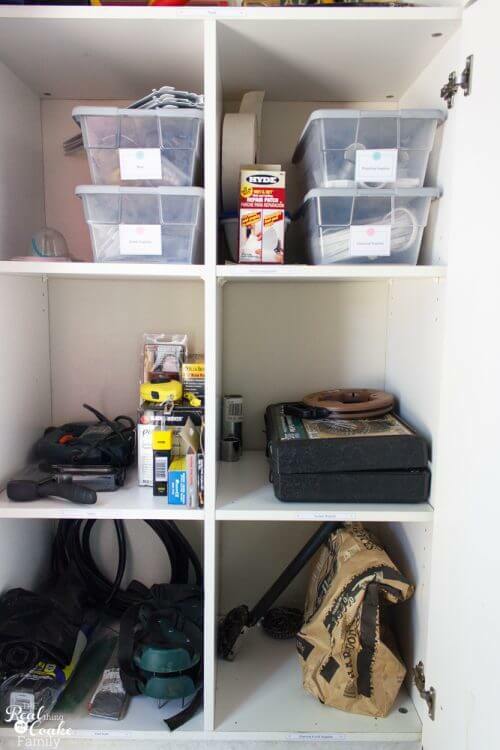 We also organized the cabinet and made it so much easier to find things in it as well. At the top of the cabinet, there are two larger shelves. They are the perfect place to put the larger tools. 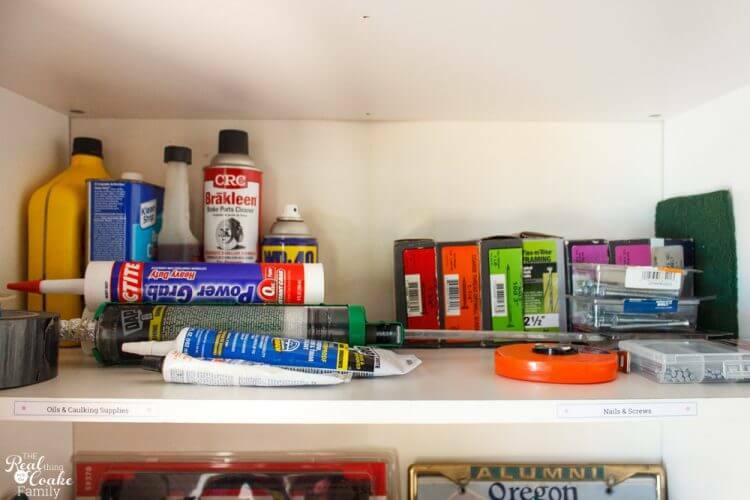 The top shelf became home to our big collection of screws and nails as well as the liquids that needed to be stored in the cabinet and our caulk collection. 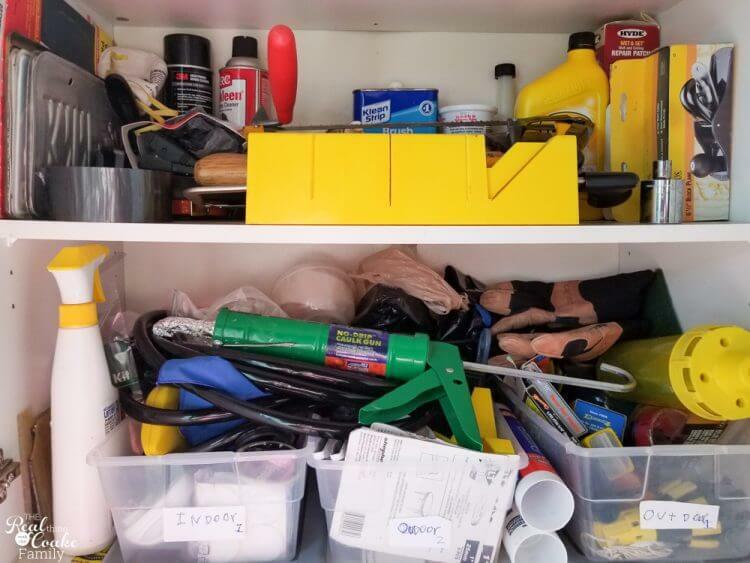 The shelf below that was the perfect place to keep some of the tools that don't fit well in the narrower shelves at the bottom of the cabinet. The most dramatic part of this organization were these shelves. We got rid of a lot of stuff. Stuff we had no idea what it was or what it was for. I don't know about you, but I love seeing shelves that just have a few things and aren't totally packed full. Mission accomplished for project organize the shed! We already had the small bins in this cabinet, so all I needed to do was to group like things together and pop them in a box. Label everything. The labels and tags kit in my shop comes with great labels that are perfect for labeling shelves like these. Once again, by labeling even the shelf, I'm making it look really great and I'm making it way more likely that my family and myself will put things back where they belong. Label everything…am I a broken record yet? 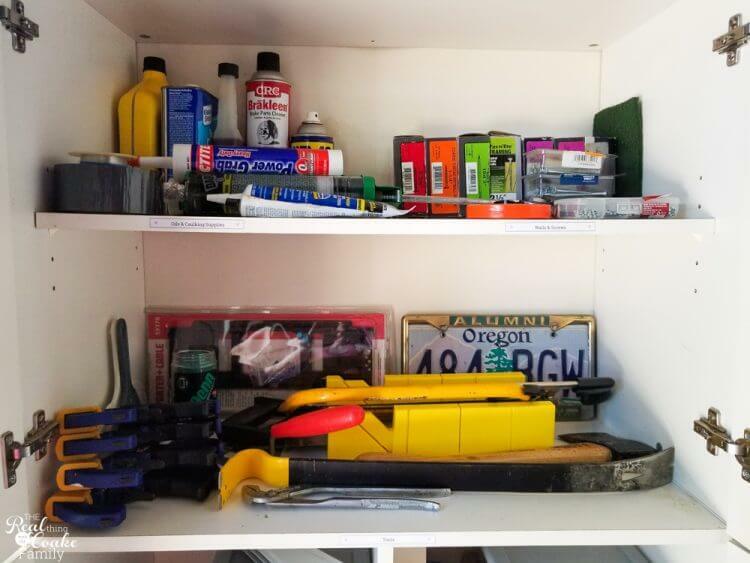 I should be but it is a really important step in any project to organize your home. 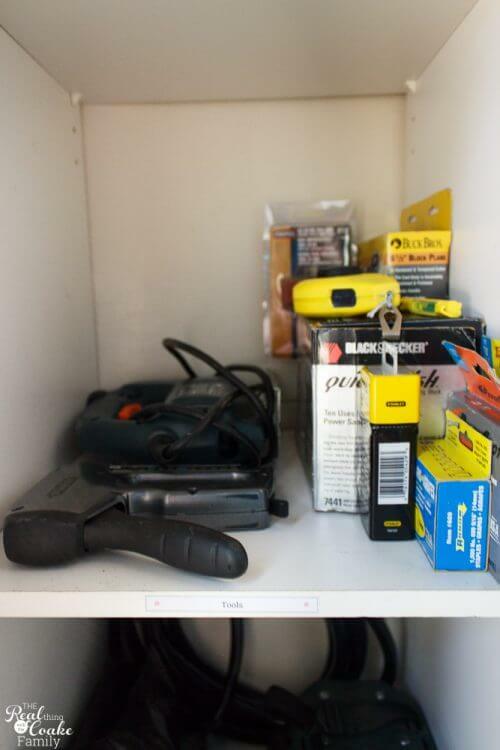 By grouping things together, it is going to make it really easy to find things in this cabinet next time I need them. The other power tools are in their storage boxes on top of the box that holds the Christmas tree. You can see that below in the picture in the upper left-hand corner. 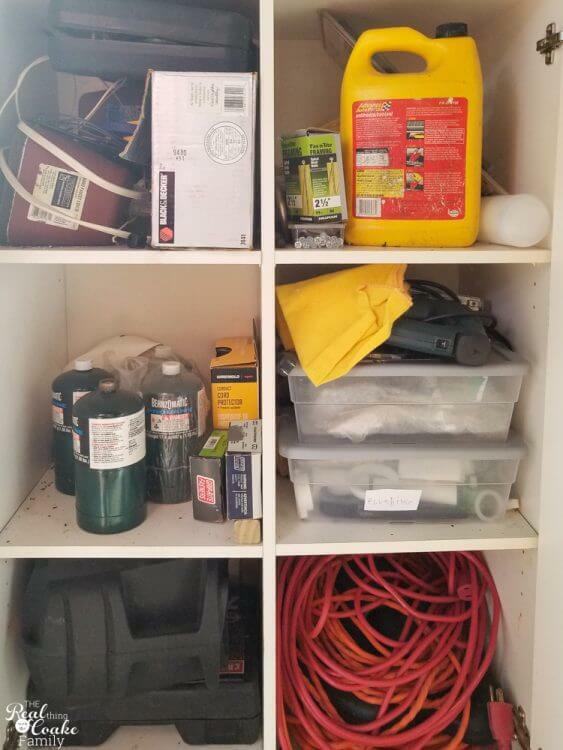 My daughters and I tackled the project to organize our shed in a few hours. That included the time to record what we were donating in It's Deductible (which if you donate much stuff, you need to look into) and putting it all in the trash or taking it to Goodwill. The end result is that we got rid of that ugly garden cart and now have a beautifully organized shed. 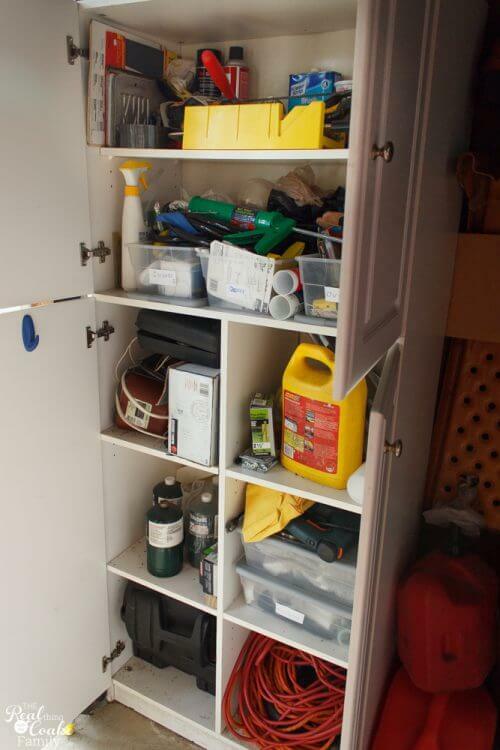 What are your tips to organize a shed, garage, or tools? Leave me a comment below. I'd love to hear more tips and ideas! Sometimes I see that mess in the garage and I just feel like throwing it all away, but yeah, your tips are great! Let’s hope they’ll help me!